There isn’t a better way to spend a Saturday morning than at the Farmers’ Market. We were a little late getting to the Kalamazoo Farmers’ Market this week because L had one more swimming lesson left. We would have liked to have gotten there earlier, but it turned out we didn’t pull in to the Bank Street market until about 12:30. Most of the vendors had already packed up for the day, but we still found a few things we couldn’t live without. J had suggested we just grab some lunch as there were still three food vendors set up and serving. All of them sounded good to me, but I was looking for something specific. 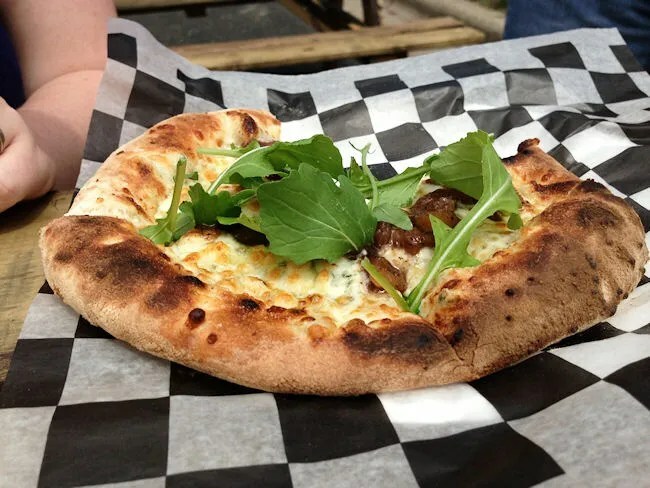 A few weeks ago, I blogged about a new brick oven pizza food truck that has set up shop at the Oshtemo Township parks. 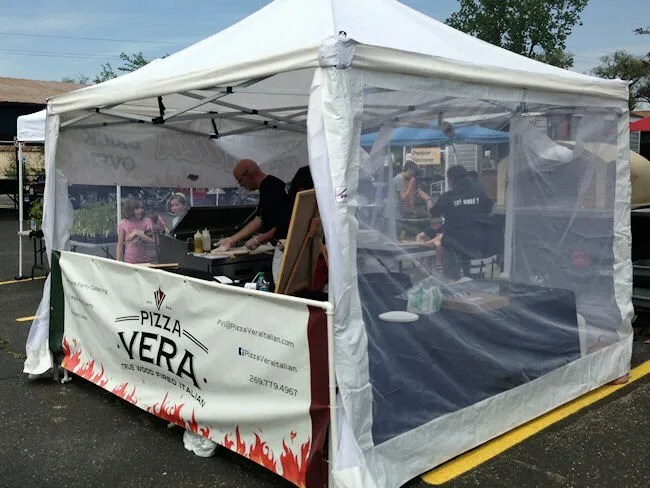 Not long after posting that blog, I got a Twitter message about another brick oven pizza food truck that was planning on setting up shop at the Farmers’ Market on Saturday mornings. It didn’t take long for me to spot what I was looking for. In the interior section of the Farmers’ Market was a white tent with a brick oven serving up pizzas. 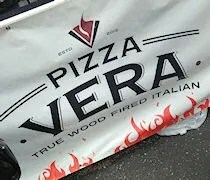 Pizza Vera is a fairly new catering company that has set up their oven on a trailer that can easily be pulled from place to place. The small menu consists of three pizzas and a couple of drinks. There are no size options and there didn’t appear to be any custom toppings. Just a handful of delicious sounding gourmet brick oven pizzas. We figured that two pizzas would be enough for the four of us (J’s mom was with us too). I’m pretty simple and went with a pretty simple pizza. My choice was the Margharita pizza. 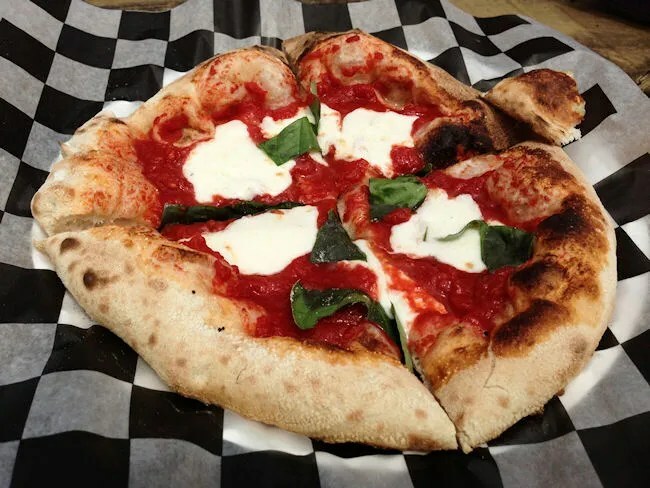 The simple, hand tossed pizza comes with a hand crushed tomato sauce, mozzarella cheese, and fresh basil. This is their staple pizza that it appears they have on the menu every week. Hand tossing the dough makes a little bit of a thicker crust which is used to hold on the piles of fresh ingredients that Pizza Vera throws on the top of their pies. The pizza comes out of the oven with that great smokey flavor that you just can’t get with any other pizza cooking method. J’s and her mom split one of this week’s features. The pizza was the Bleu Anjou which is topped with pears, Gorgonzola cheese, and arugula. We could have added prosciutto for an extra two bucks. The marinated pears and Gorgonzola cheese blew J away. She was a big fan of this pizza as was her mom. The total cost for the two pizzas was an even $20. 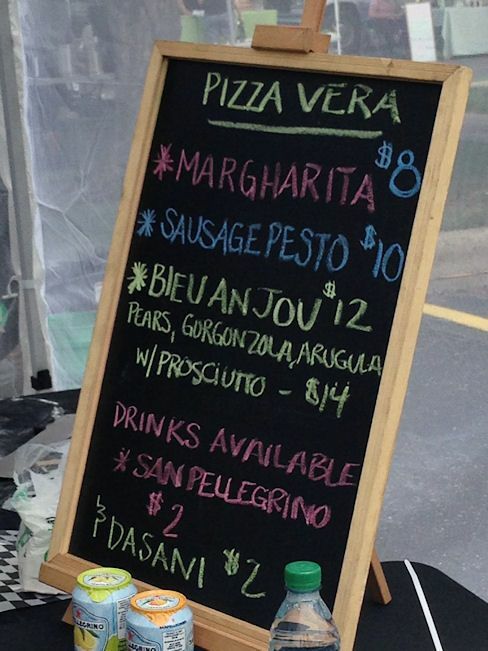 Pizza Vera is another in the continually growing stable of great food trucks in Kalamazoo. There are plenty of reasons to go to the Farmers’ Market on Sunday morning…but seriously, this is a reason to get out of bed.